A recent reader survey conducted for our magazine confirmed what we had grown to believe in the three years since we started publishing. Our readers enjoy their food and relish opportunities to eat out. Our research also told us that many readers choose to dine out on the back of our recommendations, so for that we, and our featured Suffolk eateries, are very grateful. Writing dining reviews we accept is a privilege. We get to eat at some of the best venues in the county but we also recognise in the words of Stan Lee and Spiderman (also variously attributed to Winston Churchill, Franklin D. Roosevelt and Voltaire) “with great power comes great responsibility”. We are not suggesting we have ‘great power’, but knowing that our reviews are read and acted on, we do feel the responsibility and a degree of pressure as we approach one. What if the food is poor? What if the service isn’t what we would expect? We always write as we find and our aim is to introduce our readers to good experiences rather than have to warn them from bad, but the latter is always a possibility at the back of our minds. It was, therefore, with a certain sense of relief that I approached our meal at The White Horse in Old Felixstowe, as over the last few months we had been receiving, unprompted, glowing reports of the progress that is being made there from friends, relatives and readers alike. Our review, as always, would be based on the experience we had however it was good to know we were heading somewhere with a good recent track record. Regular readers may recall that we started a recent ‘Pub walk with Darcy’ from The White Horse and I commented that I had, in the past, been, familiar with the pub as a favoured venue of my wife’s late grandmother. It had always been very pleasant and the food tasty but, in my opinion, it was a venue of convenience and ‘pub grub’ rather than one that I would have actively sought for great dining. In April 2012 Sarah Goodwin and James Couch took over with an ambitious plan to move the offering forward. It was, and remains, their intention to retain The White Horse’s position as a community pub at heart, where locals can meet and socialise, but they believed there was an opportunity to take the food to a new improved level. To help them achieve this they have invested heavily in the kitchen personnel. Head Chef Shaun Thurlow leads a talented team imparting the knowledge he has gained throughout his impressive career. Shaun previously worked as Head Chef at Woodhall Manor, The Salthouse Harbour Hotel and the Marlborough Hotel, and, during this experience, has twice gained the coveted double AA rosette. It almost goes without saying now that any chef and establishment worth talking about, or most importantly eating at, will believe in using the best local produce they can. It was, therefore, no surprise to find that Shaun feels the same and this is reflected in his menus where he aims to keep the choice fresh using locally sourced seasonal ingredients. All food is homemade and prepared on the premises with some interesting twists on the traditional. The menu at The White Horse is uncomplicated with starters, the Chophouse Grill, White Horse Classics and a daily specials board. Of the eight starters on offer six were also available as main courses -greatly increasing the choice. After much discussion and consideration my wife chose the crispy Telmara Farm duck and hoi sin salad and I, changing my mind at the last moment, went for a mixed fish platter from the specials board after so nearly ordering the roasted artichoke with crumbled goats cheeses and pickled beetroot. Both dishes were excellent. The duck was one of the options that could have been ordered as a main meal but was already very generous in portion size and the flavours balanced beautifully. My platter was equally as impressive; a generous ensemble of prawns, crayfish, smoked salmon, smoked mackerel, anchovy and trout, served with slices of local bloomer atop a well-dressed mixed salad. After nearly taking two options from the specials board for our mains, a whole dover sole and a pheasant dish – Shaun loves cooking game – we instead chose the garlic and rosemary lamb steak with dauphinoise potatoes and the 10oz Suffolk pork chop with soy glaze, mango salsa and herb mash. Lamb, when the quality is good, is without doubt my wife’s favourite meat and this certainly met with her approval cooked exactly to order and extremely flavoursome. The dauphinoise was appreciated with equal enthusiasm and having managed to purloin a mouthful myself I was in total agreement. There was nothing complex or necessarily inventive about this dish just quality ingredients skilfully cooked. My main however, the pork with the mango salsa, is one of the dishes on the menu where Shaun’s penchant to add a twist came through. 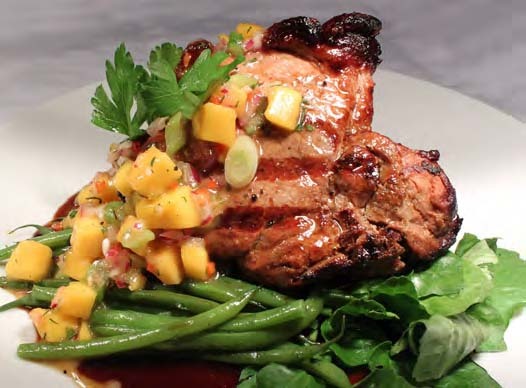 Pork is often served with fruit but a mango salsa is not an obvious choice of accompaniment so I had deliberately chosen the dish to see if it worked - a comparatively risky strategy when there were many safer options on the menu that I knew for certain I would like. I needn’t have worried though as it worked perfectly. The pork was tender and the soy glaze was an excellent yin to the yang of the sweet zingy freshness of the salsa. As we enjoyed desserts, a White Horse Eton Mess with raspberries, meringue and cream for my good lady and a moreish mixture of crystallised ginger and chocolate ice creams for me, we reflected on other changes that had been made since our previous visits to the pub. As part of the process of improvements that Sarah and James have undertaken a refurbishment of the interior has been key. Completed in October of this year, it has created sections away from the dining area where sofas and snugs beckon visitors to relax. The overall feel is brighter but still cosy. The biggest change though, apart from the quality of the food, is the service. Throughout the evening we were looked after by Szilard, the Front of House Manager, and Zoltan - an impressive team who had previously worked at both Fortnum and Mason and the Goodwood Hotel. Although we were reviewing our meal ‘incognito’ as we were finishing coffee the ladies on the table next to us, it transpired seasoned diners, started to talk to us. It was their third visit in as many weeks and soon, they too, were offering an unprompted and generous testimonial about their enjoyment. We, like them, were very impressed and would thoroughly recommend a visit.